Grip Strut®, also known as Steel Safety Grating, is lightweight, galvanized, strong, underfoot steel grating designed with safety in mind. 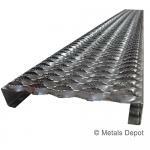 Easy to cut and weld, its one-piece construction provides slip-resistance in all directions. It is ideally suited for all sites where slippery, hazardous walking and working surfaces pose a safety challenge. Grip Strut® is available in 12' lengths or can be cut to custom size. Shop for Grip Strut - Safety Grating Online!